I only picked up three of the Shiro Cosmetics Intertube samples but now I know that I’m ok with the formula… I’ll be going back for more! 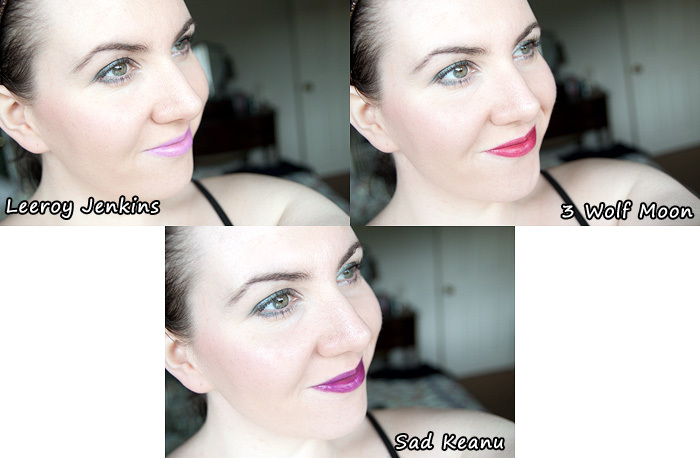 And lip swatches… I’m not sure any of them suit me – will stick to the pinks next time! You can see that each provides good coverage on the lips and can be worn more sheerly than I have above. A couple of them were a touch gritty but this melted with the heat of my lips as I applied. I’m getting me some wolf moon! 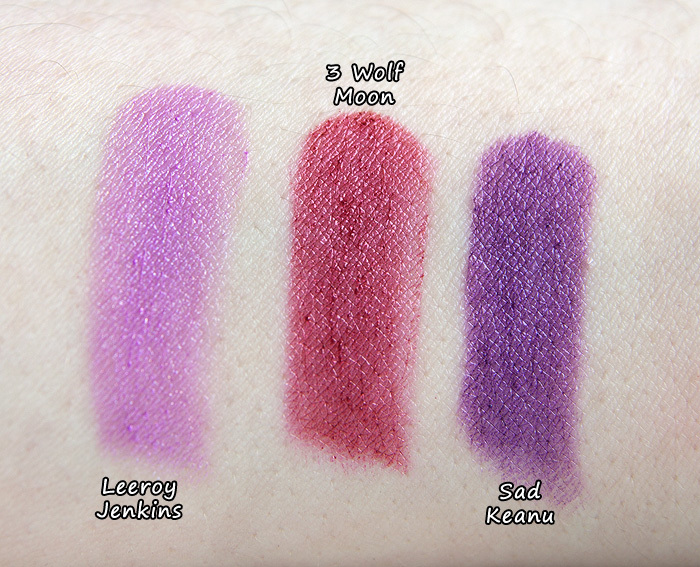 I think I’d vote no on Leeroy Jenkins, but 3 Wolf Moon and (surprisingly – who’d have thought bright purple could be so pretty?) Sad Keanu both look good on you. I bought the blue one (as well as Sad Keanu and 3 Wolf Moon) – I may at some stage post a picture just for giggles. I love 3 Wolf Moon on you – it’s perfect with your colouring. I’m with Grace about Leeroy Jenkins, it’s a no; and I’m a bit on the fence about Sad Keanu. I was eyeing these online after you introduced me to Shiro cosmetics with your loose shadow post! I think they all look good on you, but especially the first one. Love 3 Wolf Moon the best and then Sad Keanu – looks it gorgeous with your eye look too! Sad Keanu and 3 Wolf Moon look amazing on you! I have Leeroy Jenkins and while I love the colour I don’t really know what to do with it, it’s very… *there* on my face if you know what I mean? Wolf moon looks lovely on you! I thought Leeroy Jenkins looked best on you and then saw the first few comments, and thought maybe I need my eyes checked. lol I was glad to see that later commenters agreed that LJ looks good on you. They all suit you (or is it that you pull off everything?)! 3 Wolf Moon is gorgeous. Did you get stung for any customs charges at all? I agree with all the above – 3 Wolf Moon looks great on you! (And what a great name.) I actually think you carry each of the colors. You’ve got the confidence for it. 3 Wolf Moon looks gorgeous on you! Ooh pretty! I’m liking Leeroy Jenkins and 3 World Moon on you! Sad Keanu is the purple of my DREAMS. I know what I’m getting when my paycheck comes this Friday! Hello 3 Wolf Moon! On the list it goes. The purple is surprisingly pretty for such a strong, potentially Halloween-y colour. Of course, it could just be that you rock! Are the lipsticks long lasting at all? Thanks guys ill be putting 3 wolf moon and yo dawg in my cart! I love lip stains too. Just got the True blood tatters pencil I liked it. Don't forget to enter my Beauty Blender giveaway! You’ve got 1 week left to enter chaps! Click the image to be taken to the entry form and question.